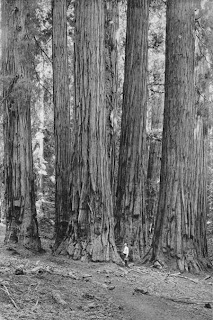 Travel and History at Online Highways and US History: California Redwoods. Redwood National Park. California Redwoods. Redwood National Park. The two types of California Redwood Forests offer visitors and hikers some of the most amazing woodland experiences on earth. On the Northern Coasts of California we find Redwood National Park and the tallest trees on earth - the Coast Redwoods, Sequoia Sempervirens. Redwood National Park combines with several California state parks to straddle highway 101 for over a hundred miles along a beautiful coastal route all the way up to the Oregon Border. When driving this route don't miss the "Avenue of the Giants" turnoff and, more importantly, DO NOT take the Orick bypass if you want to see trees and wildlife. The "Scenic Route" near Orick used to be the main route, and along this road you'll likely see Roosevelt Elk and are guaranteed to see superb Redwood forest. Stop in to the tiny Prarie Creek Redwoods visitor center for a great introduction to the region. Patrick's Point State Park with Wedding Rock and a beautiful long beach is a good spot if you can only visit one park in that area. In the Mountainous High Sierra region of east central California you find the "Giant Redwoods", Sequoiadendron Giganteum, which are the world's thickest and most massive tree by species. These Giant Sequoias are not botanically considered a "Redwood" but most people know them by that name. Sequoia National Park is home to thousands of these trees that are so wide they almost defy imagination. Its so exciting. Next time I will definitely plan my holidays to California through Southwest Airlines, its my favorite traveling store with savy coupons. Is Humboldt Redwoods State Park the place with the drive through trees? I've always wanted to see one of these giants. Redwood national park is a magnificent place and one must see this attraction at least once in a lifetime. Stout Grove has the old grown trees, it is where you will find the largest and oldest trees in the park and don't miss the wild and scenic smith river. The visitor center sits right before the trail which is heading to the redwood starts, these visitor centers are everyone's stop before they start the hike. Overall, Redwood National Park is worth visiting. Great, I will try to plan a visit to the national park!